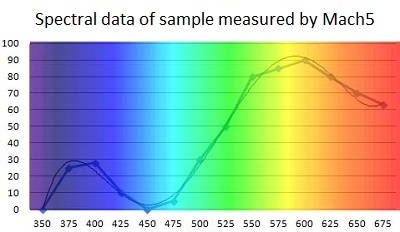 For accurate colour measurement with hyper spectral imaging technology. The Mach5 is a laboratory camera based color measurement instrument. It can measure multiple areas and multiple colors in one scan of any object placed in the drawer of the instrument. 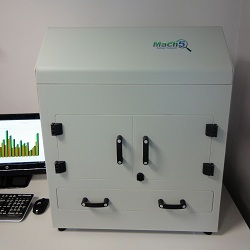 The Mach5 instrument can like a spectrophotometer measure colour accurately but has the advantages of a camera. -The Mach5 can measure multiple locations, large or small. -With the Mach5 people can work faster than with a spectrophotometer. -The Mach5 can measure various colours at the same time. -The Mach5 can give information about the area, eg. standard deviation of the colour in that area. -The Mach5 is very easy to use. -The Mach5 can be customized to a specific industry. -The Mach5 can read barcodes to identify products. -The Mach5 stores images to review later in case of a dispute. -The Mach5 gives you accurate colour values in L*,a*b* and X,Y, Z (or your own colour model on request). 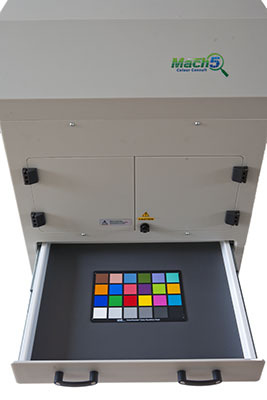 The Mach5 can be used in any industry where colour is important as a product enhancer or as a process control indicator. -Guarantee your customers a high and constant colour quality.-Work faster by measuring multiple areas in one scan. -All measured data, including a product image is saved on the pc for retrieval later. A Mach5 demonstration video can be watched online, ask us for a link. 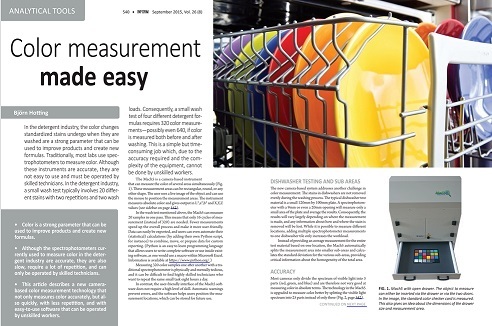 To read the article “Color measurement made easy” about the Mach5 in Inform Aocs.org, please contact us. Colour Consult developed the Mach5 and is looking for agents worldwide, please contact us if you are interested.